Sri Lanka has decided to hold a presidential election on Jan. 8 – just one week before Pope Francis visits the country. Such advancing of an election, not due for another two years, has deeply hurt the country’s Catholics. Catholics invited the pope to canonize Blessed Joseph Vaz, the country’s first saint, not for a State visit. The event was set alongside the saint’s Jan. 17 death anniversary. Catholics wished it to be a religious event, with minimal State involvement just for routine protocol. With deep frustration, they now watch the political Trojan horse invade the sanctuary. The spiritual upbuild for the canonization by groups such as the Joseph Vaz National Secretariat was first distracted with Church-State-planned pageantry for the papal visit. Thereafter political posters made it a tool for election propaganda. Election-related discord and violence may soon overshadow the event. Church leaders little realize the faith erosion caused by letting politics ruin the holiest event Catholics eagerly awaited for 303 years. Much public distress about the event’s politicization has been expressed via social media and other public exchanges. Many Catholics have urged that the canonization be postponed. Others even say it could be held in Rome like the recent canonization of Indian Saints Chavara and Alphonsa. Some prefer such moves to political denigration of the name of Father Vaz who eschewed politics, and ministered to victims of political conflict. The Indian priest had arrived in the country in 1687 dressed as a beggar to avoid Dutch colonizers’ ban on entry of Catholic priests. For 10 years he was the only priest serving the entire country until confreres joined him. 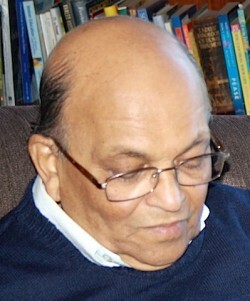 During his 24-year apostolate, he searched for Sinhala or Tamil Catholics living in hiding in the aftermath of political conflict between Portuguese and Dutch colonizers. Buddhists and Hindus valued his ascetic witness of treating king and commoner with equanimity. Saint John Paul II, who beatified Father Vaz in 1995, once described him as the greatest missioner in Asia next to Saint Francis Xavier. It was an affirmation of Lankans’ acclaim of this holy missioner’s sanctity. Since the missioner’s death in 1711, about 50 books on his life and service have been published in English, French, Italian, Konkani, Sinhalese and Tamil. Devotion to this Apostle of Sri Lanka has spread locally as well as in his Indian homeland. Since his beatification, 10 venues in four Sri Lankan dioceses hold novena devotions to Blessed Vaz. Nine dioceses have dedicated 23 churches and chapels in his honor. Apart from such public veneration, the aura of his mission still survives in the pastoral field. Trincomalee and Kurunegala dioceses have named their minor seminaries after him. Colombo, Galle and Kurunegala dioceses have opened lay theologates to promote his pioneer mission of indigenization. Amid such evidence of his living memory, Catholics countrywide have eagerly awaited the peak moment of the preparatory work by the Joseph Vaz National Secretariat, headed by Bishop Vianney Fernando of Kandy. But the spiritual benefit of these efforts will be lost if election-related rivalry and recrimination invade its final stage. Church leaders should make alternate arrangements if they cannot ensure Catholics a prayerful atmosphere to celebrate their first saint without being hassled by election unrest or militarized restrictions. The priest-director of lay apostolate in Sri Lanka’s Catholic Church has written to the country’s bishops about the much- politicized papal visit. To think that an appeal to the political parties not to use the Pope’s image for propaganda purposes will be heeded is naive, wrote the director, Fr. Leo Perera. Since the Catholic Bishops’ Conference will be meeting at the beginning of December I would like to express some thoughts regarding the proposed visit of His Holiness Pope Francis from the 13th to the 15th of January, for your consideration. I personally think that the Conference should strongly recommend to the Nuncio and to the Vatican that with the recent turn of events, the proposed visit of the Holy Father should be postponed. 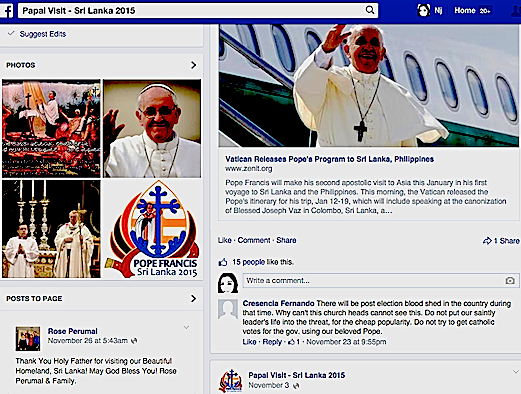 Opinions have been expressed in the social media that if the Pope is to visit the Philippines for the Eucharistic Congress in 2016, the visit to Sri Lanka could be combined with that. The canonization of Blessed Joseph Vaz can very well be carried out on a different date and even in a different place. Perhaps the understanding that His Holiness does not visit a country too close to an important national election can be cited as a valid reason for the postponement. This also is justified as the President has gone back on his assurances that the two events would not be too close to each other. We know from experience that the period before and immediately after elections have been accompanied by violence. With the elections being held on the 8th the final results will be on the 9th evening or 10th morning. This is the time when most violence takes place according to the reports of the election monitoring organisations. In such a situation the security forces will be very involved in trying to keep the peace. Although His Holiness may not be concerned for his personal safety, his presence in a situation of turmoil and political strife, will invariably sully the image of the Papacy. If violence does occur, it can also lead to extremists terming Catholics as being anti-national if our concerns are diverted to the Papal visit. It is being naïve to think that an appeal to the political parties not to use the Pope’s image for propaganda purposes will be heeded. Naturally posters will come up (as they already have) and each side will deny responsibility. The Catholic Bishops’ Conference of Sri Lanka faces a dilemma because already many preparatory committees are in place and a lot of money has been spent, both by the state and by the Church. However in the present situation financial concerns cannot be given priority. While on the one hand there might be a loss of face or prestige, on the other hand, pressing ahead with the visit at this time will have more disastrous consequences for the Catholics in Sri Lanka with the impression being created that once more the Church is favouring the President. I present these suggestions in good faith and in the hope that it will assist you in discerning the proper decision to be made. Sri Lankan theologian Father Reid Shelton Fernando in online discussion shared his opinion posted below on why Pope Francis should not come to Sri Lanka as planned following announcement of the Jan. 8, 2015 schedule of presidential elections in the South Asian nation. “According to the situation of the presidential elections fixed for the 8th (of)* January and (whether) it is (or not) conducive to have his (pope’s) visit on the 13th (of) Jan.
a) The politcians have already politicized this visit by having banners, cut (outs) and posters. b) Must take (into consideration) the political culture during elections – It is very violent and more it will be that the Ex- Govt. party member/ex minister is contesting against the incumbent president and already (campaigning) had started which will end up in violence and election malpractices. After the elections on the 8th when the results (are) announced on the 9th there will be vilification actions conducted. This had been the trend in the last few decades. c) In this mood as the Sri Lankan Catholic Community is only 6% to 7 % they (may also) face violent reactions from the Extremists Groups. d) If the incumbent president is defeated then the new person elected will not be able to monitor the organization process of the papal visit. e) From the side of the Church, the preparations for the papal visit was only to have an external show or demonstration of power. There is spiritual preparations planned but had not simmered down yet to the faithful in the grass-root level. Even (the) canonization of Blessed Joseph Vaz has not figured in the last few months. f) There can be alternative proposal as His Holiness is due to Philippines in Jan 2016 for the International Eucharistic Congress, he can make the visit then there is enough time to prepare spiritually and take cognizance of the life and works of Blessed Joseph Vaz. Therefore, we can wait for one more year as there is no urgency. (What) is needed (is) that we – all faithful – be imbibed with the spirit of Blessed Joseph Vaz. Cardinal Malcolm Ranjith, the Archbishop of Colombo, at the meeting of clergy of the Archdiocese of Colombo on Monday 27th October 2014 at the Archbishop’s House, confirmed Pope Francis’ visit to Sri Lanka on Jan. 13 and 14, 2015, the archdiocese reported on its website. A delegation from the Vatican is reportedly expected to arrive in Sri Lanka to work out the program me for the Pope’s visit. Questions about the pope’s announced visit arose in recent weeks after news broke of possible elections in the country in January. In a letter to Sri Lanka President Mahinda Rajapaksa, Cardinal Ranjith reportedly asking the president to inform the church about the date of election and informed the nation’s leader that it was not appropriate for the Pope to visit any country at times of national elections. Sri Lanka government reportedly confirmed Oct. 26 that the government is taking necessary steps, including necessary infrastructure arrangements, as planned, to facilitate the arrival of Pope Francis. Pope Francis’ scheduled visit to Sri Lanka in January next year is still on track as the Government has not made any official announcement of a Presidential Election, Catholic Church Spokesman Rev. Cyril Gamini said. Although there was confusion earlier over the Pontiff’s visit because of an impending Presidential Election in January, Fr. Cyril Gamini said that the scheduled itinerary will not be changed as the Church has not been informed of an election in January. Pope Francis announced on Monday that Blessed Joseph Vaz, the Apostle of Sri Lanka, will be declared saint on Jan. 14, 2015, Vatican News reported.